One of the hot topics at the SCBWI Summer conference was that inevitable question: “Is the physical printed book, as we know it - dead?” The subtext of the question is asking if the advent of e-books is taking over print and if bookstores may be relegated to the dustbin of history. What does the future really hold for those of us who write, publish and illustrate books? On August 4th, a panel of world-class editors, including Neal Porter, Tamar Brazis, Jordan Brown, Laura Godwin, Elise Howard and Farrin Jacobs all weighed in on the subject, and their answers surprised me – pleasantly. In this climate of changes in technology, recessionary times and the demise of bookstores, children’s book publishing is trying to find equilibrium; but overall, the manufacturing of books is experiencing a general downgrade of quality. Print books are becoming more archival, more collectible and more of a durable good. A book is an appreciated, treasured object that can be passed on to new generations of readers. A book on an iPad is generally still pretty boring; sold as an app for 99 cents, but can cost $40,000.00 to make. Be careful not to freak ourselves out. 80% of children’s book publishing is in print. There is always going to be a place for physical books. “Digital” opens up possibilities and opportunities for more work, particularly for illustrators. With “digital” we have yet another venue that gets kids reading. Practically, you are not going to give a kid an $800.00 iPad (although I have witnessed this numerous times to the contrary), but a book that costs $2.95 is pretty safe for a kid to chew, eat on, and splash stuff on. Expensive tablets will get lost, damaged and drowned in bathtubs. It’s much more practical to give a little kid an inexpensive physical book. Y.A. (Young Adult) publishing is experiencing the greatest growth in e-book sales; now it’s about 50/50 paperbacks vs. e-books. One editor said she is absolutely not engaged with digital; she loves the paper and format of a real physical book (applause rang out from the audience here). 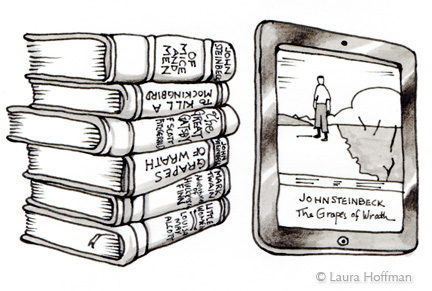 In this digital landscape, the shift from physical book to e-book transforms what a book really is. E-Readers encourage the purchase of books. This is actually very exciting for us, as this encourages literacy, opens up more opportunities for those of us who work in the publishing industry – and many of us who are daunted by thick books with small print prefer the convenience of e-books. The editor panel agreed that print books will strengthen as technology evolves, while e-books will also improve. Right now, the consensus is that e-books for children are just copies of print books that sometimes try to be “lame video games,” but some innovator is going to come out with e-book delivery that will knock the medium out of the park. Kids are now “digital natives,” knowing a life only with all kinds of digital technology at their tiny fingertips. Any e-reader has to compete with the onslaught of diversions surrounding us. Books compete with movies, video games, social media and other things that move and blast the senses. Creators of e-books for children must bear this in mind: a kid may go for a live action movie or game in favor of a weakly animated little picture book on an e-reader. Finally, remember this: a book is a self-paced entertainment source. An animated thing is not. It’s up to the reader to turn the page. Great post - I think this has always been an interesting debate. While I don't believe print is dead, I do believe (with the price of ereaders decreasing and the current generation of children being "digital natives") that digital books, even picture books, are in a position to become the dominant book form. Whether or not that happens, remains to be seen, but print should exist if only because of the nostalgia aspect. 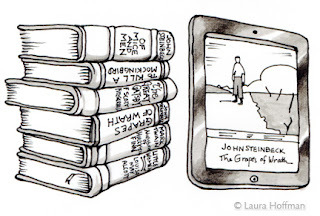 Something is certainly lost with digital books. The touch and smell of an old, well-read novel or the crisp pages and snap of a binding when a new book is opened, cannot be replaced. Beautiful illustration! Thank you so much for that :) I couldn't agree more. Plus, a book never has to be turned on or off, or run out of batteries.